رهنما, حسین, شکریه, محمود مهرداد. (1394). تحلیل دقیق مایکرومکانیکی تنش در کامپوزیت تقویت شده با الیاف بلند تحت بارگذاری کششی یکنواخت. 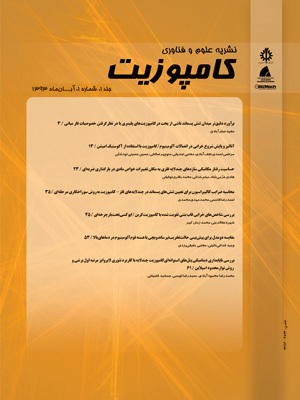 علوم و فناوری کامپوزیت, 2(3), 1-10. حسین رهنما; محمود مهرداد شکریه. "تحلیل دقیق مایکرومکانیکی تنش در کامپوزیت تقویت شده با الیاف بلند تحت بارگذاری کششی یکنواخت". علوم و فناوری کامپوزیت, 2, 3, 1394, 1-10. رهنما, حسین, شکریه, محمود مهرداد. (1394). 'تحلیل دقیق مایکرومکانیکی تنش در کامپوزیت تقویت شده با الیاف بلند تحت بارگذاری کششی یکنواخت', علوم و فناوری کامپوزیت, 2(3), pp. 1-10. رهنما, حسین, شکریه, محمود مهرداد. تحلیل دقیق مایکرومکانیکی تنش در کامپوزیت تقویت شده با الیاف بلند تحت بارگذاری کششی یکنواخت. علوم و فناوری کامپوزیت, 1394; 2(3): 1-10. در این مقاله سعی بر این است که بر اساس یک روند نظام‌مند در حوزه‌ی تئوری الاستیسیته، برای مسئله‌ی مقدار مرزی المان حجمی معرف کامپوزیت الیاف بلند تحت بارگذاری کشش یکنواخت، یک حل بسته‌ی دقیق ارایه شود. برای این منظور المان حجمی معرف کامپوزیت‌های الیاف بلند در نظر گرفته شد که متشکل از دو استوانه‌ی هم‌مرکز با استوانه‌ی درونی از جنس الیاف و استوانه‌ی بیرونی از جنس ماتریس است. بدین ترتیب مسئله‌ی مورد بررسی در این پژوهش در حوزه‌ی مسائل متقارن محوری تئوری الاستیسیته قرار می‌گیرد. با بهره‌گیری از تابع لاو برای مسائل متقارن محوری، دستگاه معادلات تعادل ناویر برای مولفه‌های میدان جابجایی تبدیل به یک معادله‌ی بای‌هارمونیک بر حسب تابع لاو می‌شود. سپس یک عبارت جامع برای حل‌های جداپذیر معادله‌ی بای‌هارمونیک در مختصات استوانه‌ای ارائه می‌شود. در گام بعدی، عبارات مناسب از حل‌های جداپذیر با الهام از شرایط مرزی و فیزیک مسئله انتخاب شده و یک حل پیشنهادی استخراج می‌شود. در گام نهایی ثوابت مجهول موجود در حل پیشنهادی توسط شرایط مرزی به‌دست می‌آیند. بدین ترتیب حل دقیق به‌دست آمده قادر به ارضای تمامی معادلات میدانی تئوری الاستیسیته است. با استفاده از این حل توزیع دقیق مولفه‌های میدان تنش و جابجایی در المان حجمی معرف مشخص شده و برخی نتایج عددی برای آن ارایه می‌گردد. بر اساس این حل دقیق عبارتی برای مدول الاستیک طولی معادل کامپوزیت الیاف بلند به‌دست می‌آید و با رابطه‌ی معروف قانون اختلاط مقایسه می‌شود. این مقایسه نشان می‌دهد که قانون اختلاط می‌تواند تقریب مهندسی خوبی برای محاسبه‌ی مدول الاستیک طولی معادل باشد. In this paper, based on a systematic procedure in the field of theory of elasticity, it is tried to establish an exact closed form solution for the problem of a long-fiber composite representative volume element (RVE) under uniform tension loading condition. To this end, the RVE of long fiber composites is considered. The RVE is composed of two concentric cylinders where the inner and outer ones are of fiber and matrix materials, respectively. Consequently, this study deals with an axially symmetric problem of the theory of elasticity. Using the Love function for axisymmetric problems, the Navier equilibrium equations for displacement components are converted to a single biharmonic equation in terms of the Love function. Then, a general expression for the separable solutions of biharmonic equation in cylindrical coordinates is derived. Next, according to the boundary conditions and physical interpretations, appropriate terms from separable solutions are chosen and a solution is suggested. In the final step, the unknown constants in the suggested solution are computed by using the boundary conditions. The obtained exact solution satisfies the entire field equations of theory of elasticity. Using this solution, the exact distribution of stress and displacement field components of the RVE is determined and related numerical results are presented. Based on the exact solution, an expression for the equivalent longitudinal modulus of composite is obtained and compared with the well-known rule of mixture formula. This comparison reveals that the rule of mixture can be a good engineering approximation for the equivalent longitudinal modulus. McCartney, L. N., “New Theoretical Model of Stress Transfer between Fiber and Matrix in a Uniaxially Fibre-Reinforced Composite,” Proceedings of the Royal Society of London. A. Mathematical and Physical Sciences, Vol. 425, No. 1868, pp. 215–244, 1989. Kurtz, R. D. and Pagano, N. J., “Analysis of Deformation of a Symmetrically Loaded Fiber Embedded in a Matrix Material,” Composites Part B: Engineering, Vol. I, No. 1, pp. 13–27, 1991. Nairn, J. A., “A Variational Mechanics Analysis of the Stresses around Breaks in Embedded Fibers,” Mechanics of Materials, Vol. 13, No. 2, pp. 131–154, 1992. Nairn, J. A., “On the Use of Shear-lag Methods for Analysis of Stress Transfer in Unidirectional Composites,” Mechanics of Materials, Vol. 26, pp. 63–80, 1997. Pagano, N. J., “Axisymmetric Micromechanical Stress Fields in Composites,” Local Mechanics Concepts for Composite Material Systems, Springer, pp. 1–26, 1991. Wu, Z. J. Ye, J. Q. and Cabrera, J. G., “3D Analysis of Stress Transfer in the Micromechanics of Fiber Reinforced Composites by Using an Eigen-Function Expansion Method,” Journal of the Mechanics and Physics of Solids, Vol. 48, 2000. Hashin, Z. and Rosen, B. W., “The Elastic Moduli of Fiber-Reinforced Materials,” Journal of Applied Mechanics, Vol. 31, No. 63, 1964. Netravali, A. N., Schwartz, P. and Phoenix, S. L., “Study of Interfaces of High-Performance Glass Fibers and DGEBA-Based Epoxy Resins Using Single-Fiber-Composite Test,” Polymer Composites, Vol. 10, No. 6, pp. 385–388, 1989. Piggott, M. R., “Debonding and Friction at Fibre-Polymer Interfaces. I: Criteria for Failure and Sliding,” Composites Science and Technology, Vol. 30, No. 4, pp. 295–306, 1987. Mandell, J. F. Chen, J. H. and McGarry, F. J., “A Microdebonding Test for in Situ Assessment of Fibre/Matrix Bond Strength in Composite Materials,” International Journal of Adhesion and Adhesives, Vol. 1, No. 1, pp. 40–44, 1980. Gaur, U. and Miller, B., “Microbond Method for Determination of the Shear Strength of a Fber/Resin Interface: Evaluation of Experimental Parameters,” Composites Science and Technology,” Vol. 34, No. 1, pp. 35–51, 1989. Cox, H. L., “The Elasticity and Strength of Paper and other Fibrous Materials,” British journal of Applied Physics, Vol. 72, 1951. Hsueh, C.-H., “Interfacial Debonding and Fiber Pull-out Stresses of Fiber-Reinforced Composites VII: Improved Analyses for Bonded Interfaces,” Materials Science and Engineering: A, Vol. 154, No. 2, pp. 125–132, 1992. Whitney, J. M. and Drzal, L. T., “Axisymmetric Stress Distribution around an Isolated Fiber Fragment,” Toughened Composites, ASTM STP, Vol. 937, pp. 179–196, 1987. Hashin, Z., “Analysis of Cracked Laminates: a Variational Approach,” Mechanics of Materials, Vol. 4, No. 2, pp. 121–136, 1985. Hashin, Z., “Analysis of Stiffness Reduction of Cracked Cross-Ply Laminates,” Engineering Fracture Mechanics, Vol. 25, No. 5, pp. 771–778, 1986. Wu, W. Desaeger, M. Verpoest, I. and Varna, J., “An Improved Analysis of the Stresses in a Single-Fibre Fragmentation Test: I. Two-Phase Model,” Composites Science and Technology, Vol. 57, No. 7, pp. 809–819, 1997. Wu, W. Verpoest, I. and Varna, J., “An Improved Analysis of the Stresses in a Single-Fibre Fragmentation Test—II. 3-Phase Model,” Composites Science and Technology, Vol. 58, No. 1, pp. 41–50, 1998. Wu, W. Verpoest, I. and Varna, J., “A Novel Axisymmetric Variational Analysis of Stress Transfer into Fibres through a Partially Debonded Interface,” Composites Science and Technology, Vol. 58, No. 12, pp. 1863–1877, 1998. Wu, W. Jacobs, E. Verpoest, I. and Varna, J., “Variational Approach to the Stress-Transfer Problem through Partially Debonded Interfaces in a Three-Phase Composite,” Composites Science and Technology, Vol. 59, No. 4, pp. 519–535, 1999. Smith, G. E. and Spencer, A. J. M., “Interfacial Tractions in a Fiber-Reinforced Elastic Composite Material,” Journal of the Mechanics and Physics of Solids, Vol. 18, No. 2, pp. 81–100, Apr. 1970. Grinchenko, V. T., “The Biharmonic Problem and Progress in the Development of Analytical Methods for the Solution of Boundary-Value Problems,” Journal of Engineering Mathematics, Vol. 46, No. 3–4, pp. 281–297, 2003. Nairn, J. A. and Liu, Y. C., “Stress Transfer into a Fragmented, Anisotropic Fiber through an Imperfect Interface,” International Journal of Solids and Structures, Vol. 34, pp. 1255–1281, 1997. Boresi, A. P. Chong, K. and Lee, J. D., “Elasticity in Engineering Mechanics,” John Wiley & Sons, New Jersey, 2011. Rahnama, H., “Micromechanical Stress Analysis of Long Fiber Composites,” In Persian, MSc Thesis, Department of Mechanical Engineering, Iran University of Science and Technology, Tehran, 2015.